Down. Dizzy. Pitching left. He is draining away like dirty water, round and round. Stumbling not walking, the ground threatening to come up and meet him. And yet he presses on. Something’s not right. As dusk falls a young man staggers through a park, far from home, bleeding from a stab wound. He dies where he falls; cradled by a stranger, a woman's name on his lips in his last seconds of life. DI Manon Bradshaw can't help taking an interest - these days she only handles cold cases, but the man died just yards from the police station where she works. She's horrified to discover that both victim and prime suspect are more closely linked to her than she could have imagined. As the Cambridgeshire police force closes ranks against her, she is forced to contemplate the unthinkable. How well does she know her loved ones, and are they capable of murder? 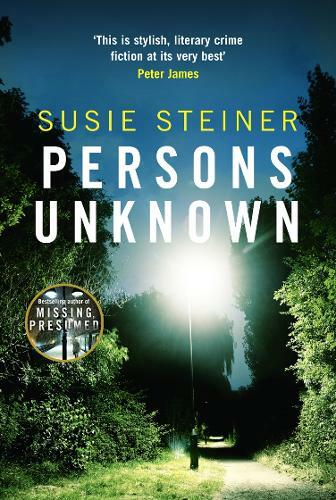 Described by The Essex Serpent author Sarah Perry as “the best new crime series in years”, Persons Unknown follows up on the first novel in the Bradshaw series, Steiner’s successful debut Missing Presumed. Happy to say this worked as a brilliant thriller in its own right! Phew! It is unusual in police procedurals to deliver such a strong, empathetic human element. Manon, our DS in Persons Unknown and the previous novel (Missing, Presumed), embodies that feeling entirely.